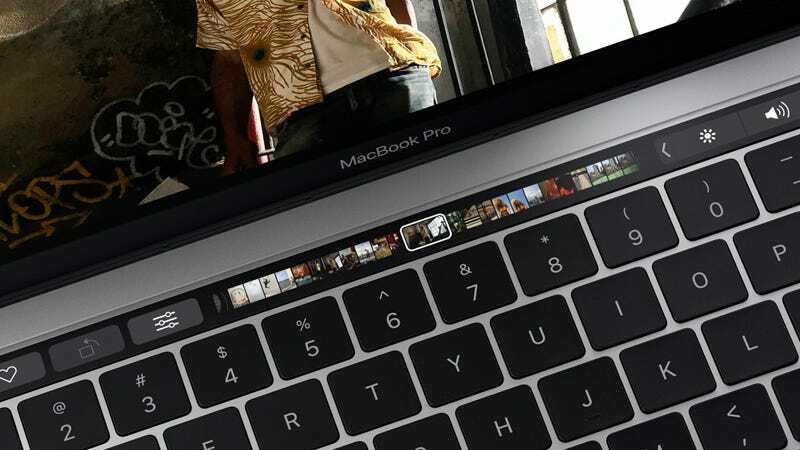 Replacing the function keys, Touch Bar is a retina touchscreen strip which changes dynamically based on what apps are in use. Besides the standard actions we’re accustomed to performing with that piece of keyboard real estate (volume and brightness controls, for example) here’s everything we know it can do so far. Touch Bar also can be used to cycle between apps. Each app has specific functionality. In Final Cut Pro, for example, Touch Bar can be used to add effects, make edits, or show an overview of the timeline. Photoshop gets sliders for brushes and other tools. More importantly, Touch Bar tools allows you to edit photos in fullscreen mode without having to clutter up the image with your modules. Similar to Final Cut, Touch Bar also has rich functionality within DJ Pro to add effects and preview waveforms on the fly. One assumes similar tools will exist for Apple’s own GarageBand and Logic. In Preview, you can use the Touch Bar to quickly swipe through photos. It’s also got tools for small edits like cropping and rotating images. Touch Bar buttons allow you to quickly play, pause, and scrub video. In Mail, Touch Bar adds quick keys for commonly used actions, like flagging messages or sending them to the trash. In iMessage, Touch Bar allows you to pull emoji. The Touch Bar has a predictive text feature much like hte iPhone keyboard, and it will supposedly be able to learn which words and phrases you’re likely to type next. The presence of keylogging software on yet another device is either extremely convenient or worrisome, depending on how you see it. While the Touch Bar by default pulls up app-specific functions, it’s also fully customizable for those who want to change their workflow at the system level. And for those who can’t see Touch Bar being useful, Apple will still be selling a 13-inch model without it, starting at $1,500. 15-inch users, however, are getting Touch Bar whether they like it or now.